A global trend to build indoor multi-sport freestyle centres is gathering pace with the imminent opening of Western Switzerland’s first, Chalet Alaïa in the Swiss resort of Crans-Montana. Indoor freestyle centres are places where skaters, bikers, boarders and skiers, amongst other freestyle sports fans, can hang out together and participate in their sports at any level – from complete beginner to Olympic pro. Infact the whole point of indoor freestyle is to give the next generation of freestyle stars a place to first learn, then hone their skills, whilst also providing advanced training facilities for those already at the top of their game. But these should not be confused with indoor snow centres or ‘snowdomes’ as they’re sometimes known. There’s no snow in an indoor freestyle centre, but there is everything you could need to try out a freestyle trick in any one of dozens of disciplines, and land it safely. An estimated 140 million people in Europe age 15-34 participate in the four biggest action sports of surf, snowboard, ski and skateboard with millions more aspiring to the action sports lifestyle so there’s certainly a growing market there to be catered for. Action sports are filtering into the mainstream with Olympic sports, including skateboard, surfing, sport climbing and freestyle BMX, debuting in Tokyo 2020 and snowboard and free ski already firmly established in the Winter Olympics. 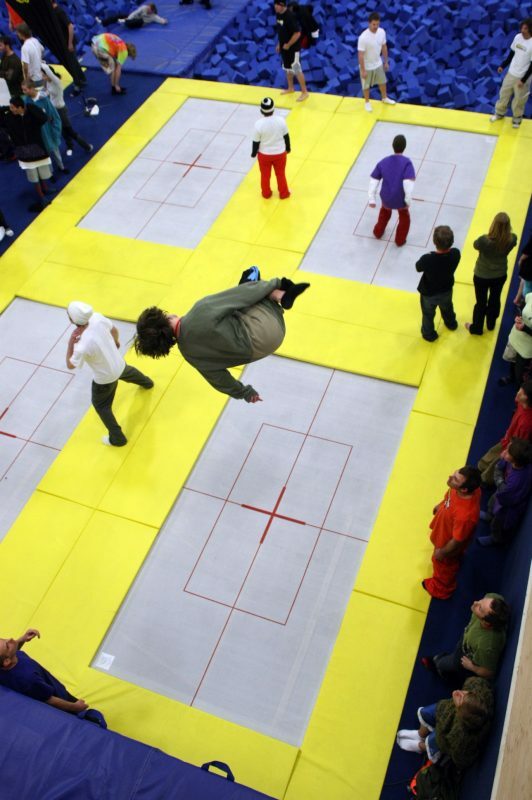 The idea to build the very first indoor freestyle centre took off in 2008 in Colorado when the indoor Woodward complex was built at the ski resort of Copper Mountain (pictured top and below). Still going strong a decade later, the company has since built a second facility at Boreal ski area by Lake Tahoe in California and is working on a third at 2002 Winter Olympic venue Park City in Utah, due to open in December 2019. Elsewhere in the world similar facilities have opened in Mexico, Switzerland and most recently at Manchester in the UK where the Graystone Action Sports Academy opened this December. Visitors can use the facilities just for a few hours or in many cases can sign up for week-long progression camps to really get to grips with a discipline or a trick. Many top freestyle athletes have credited the creation of these facilities as key to their progress to the pinnacle of their sports. 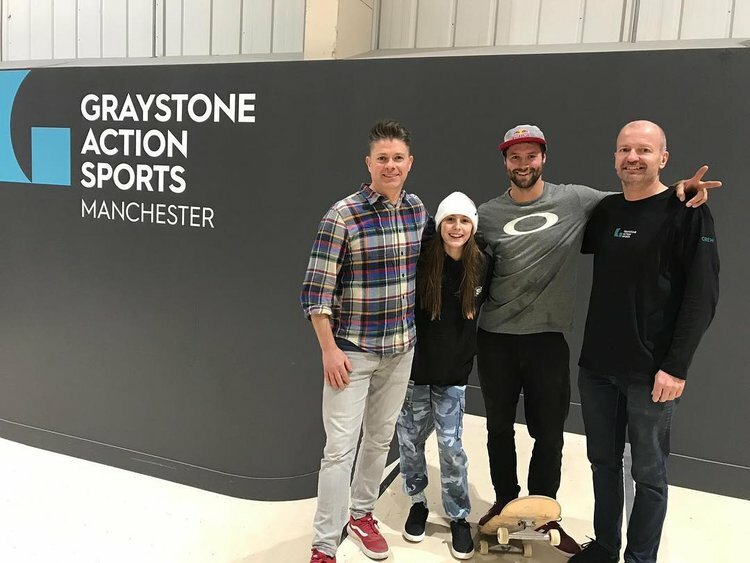 The Manchester facility has signed up British Bronze medallist in the Men’s Big Air Snowboarding at the 2018 Winter Olympics Billy Morgan as well as up and coming 11-year-old snowboarder Mia Brookes, named as “one to watch” by the British national team as Graystone ambassadors (pictured below). The great thing too is that fans of both summer and winter freestyle sports can train along-side one another year-round. For skiers and boarders this can include sliding into a jump on an artificial ski surface, but skiers, bikers, boarders and the rest all have the same big foam pits to land safely in after their trick. Excitement is now building for the opening of the very first indoor and outdoor action sports centre in Western Switzerland, which is due to open in February 2019 after several years of planning then construction. Chalet Alaïa is located in the Lens area close to the chic and stylish ski resort of Crans-Montana, in the Swiss Valais region, two hours from Geneva. 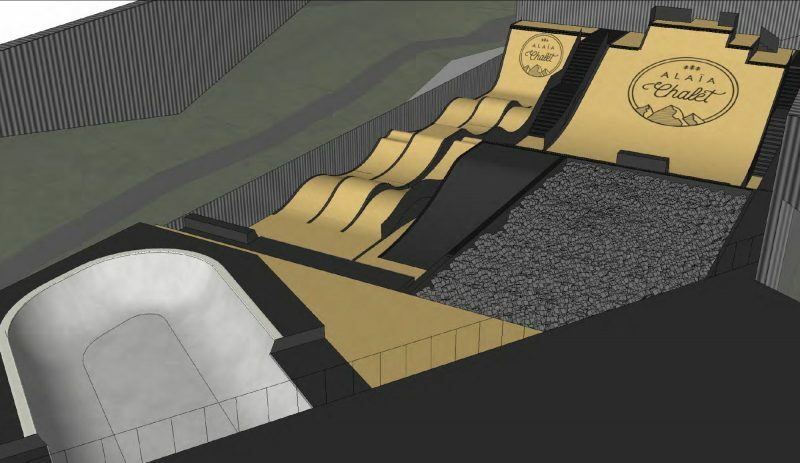 This world-class training facility for freestyle skiers and snowboarders as well as bikers and skateboarders will feature trampolines, indoor ramps, foam pits, bowls and a magnificent outdoor skatepark making it possible to enjoy different sports year-round. The facility will compliment Crans-Montana’s existing, highly-regarded snowpark, bikepark and wakepark enabling skills mastered in the new indoor facility to be transferred for further practice in the existing outdoor facilities. 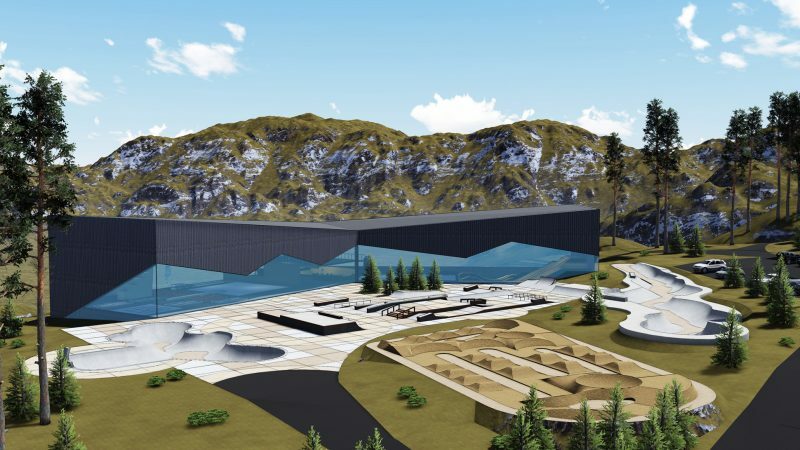 Altogether the complex will offer more than 5,000 square metres of indoor and outdoor space providing the famous Swiss resort with a major new attraction for locals and holidaymakers alike with Chalet Alaïa becoming one of the largest and most complete action sport centres of its kind. The team behind the project don’t plan to rest when the centre opens in February either, in the summer of 2020 a sister-facility, the Alaïa Wave, will open – the first outdoor surf centre in Switzerland, located in the central Valais area, again very close to Crans-Montana.